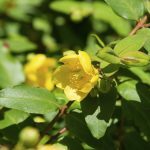 I have several Hidcote St. John's Wort bushes for about 5 years now. This year they are growing nicely, very big and bushy, but hardly any flowers. I have them cut back each year in early spring. Is there anything I can do to have them flower more? Thanks. By pruning your shrub in Spring you are simply cutting off that years flower buds.Prune after flowering in (say) October, but don't leave it too late. Then the buds will develop for next year.